School districts must provide a child with disabilities with special education, an educational program individually designed to meet the child’s unique needs and that prepares the child for employment and independent living. This education must account for the child’s disability and offer the opportunity for significant learning at public expense. The school district must also provide developmental, corrective, and supportive services necessary for the child to receive a benefit from the educational program, including transportation, physical therapy, occupational therapy, speech/language therapy, counseling or psychological services, and even parent counseling and training. All of this must be provided in the least restrictive environment, or, in other words, to the maximum extent appropriate the child with a disability must be educated together in the general education classroom with children without disabilities. The school district must provide appropriate aids and services to ensure this happens. 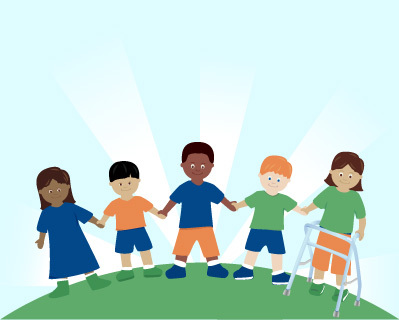 Children with disabilities must also be given the opportunity to participate in extracurricular activities and non-academic classes (such as music, art, and gym) to the same extent as children without disabilities. To develop each child’s unique Individualized Education Plan (IEP), the school district convenes a child study team consisting of a school psychologist, social worker, and others, who work with the child’s teachers and parents. Each child is also assigned a case manager to work as the point person for coordinating the development, monitoring, and evaluation of the effectiveness of the IEP. Ideally, the child study team and parents will work together and create an IEP carefully tailored to the child’s needs, and the child will receive a meaningful education that prepares him or her for life after schooling ends. Failing to develop or implement an IEP addressing the child’s unique needs. Failing to prevent punishment of a child for actions caused by the child’s disability. Failing to provide education in the least restrictive environment to the maximum extent appropriate, in the general education classroom with children without disabilities. Failing to conduct the necessary evaluations. Failing to provide extended school year services. Failing to allow a child with disabilities the chance to participate in extracurricular activities. Each of these actions violates the law. A disability should not subject a child to unfair treatment. For each child with a disability, the school district has a legal obligation to develop and implement an IEP with full participation of the child and parents. The parents know the child better than any teacher or administrator. The school district also must provide for the child independent of budgetary or staffing concerns. But parent frequently do not know their legal rights. Intimidated by school district personnel, or simply convinced that the district has their child’s best interests at heart, parents submit to IEPs and actions that do not provide their child with the education he or she is entitled to under the law. This has a serious impact on the child’s educational progress. The Law Offices of Todd Wilson provides practical and exhaustive advice on your child’s right to an education. Mr. Wilson will also provide assertive and persistent legal representation to ensure that school districts provide your child with the education he or she is entitled to under the law. Mr. Wilson is a tireless advocate for children with special needs and their families, to ensure they get the services and support they are entitled to under the law. Having clashed with school district personnel on IEP issues with one of his own children, Mr. Wilson is sensitive to the emotional of these disputes, and will work to devise and implement an effective education plan that prepares children for life. Currently, Mr. Wilson is involved in the largest special education case in New Jersey history, representing Disability Rights New Jersey, the Education Law Center, the Statewide Parent Advocacy Network of New Jersey and The Arc of New Jersey on behalf of children with disabilities across the state in a lawsuit in the United States District Court for the District of New Jersey against the New Jersey Department of Education to enforce laws governing the education of children with disabilities. With co-counsel Lowenstein Sandler, the Education Law Center, Disability Rights New Jersey, and Loughlin & Latimer. The suit alleges that children with disabilities are systematically segregated from classrooms with children who do not have disabilities, in violation of the law, including IDEA’s inclusion mandate. Children with disabilities in segregated special education settings face rote and mechanical instruction and low expectations. In general education settings, these children are often denied the aids, services and accommodations needed to receive an appropriate education. They are often punished with loss of recess, points and activities, and are retained for failing grades or promoted without any educational gains. Conversely, benefits to inclusion include improved academic skills, higher grades, higher scores on standardized tests, larger friendship networks, improved attendance and higher self-esteem. Benefits to non-disabled children include improved reading and mathematics performance and social and developmental benefits, such as improved understanding of, and relationships with, children with disabilities.